RadChartView is essentially a toolset of charting components designed to help you create a variety of rich data-visualization applications. This tutorial will walk you through the creation of a sample application that contains a RadChartView component. The RadChartView suite provides four different chart types. Each of these charting components is designed to best fit specific use cases. You can read more about the charts in the ChartTypes help article. For demonstration purposes, this tutorial will use the RadCartesianChart component. It uses a Cartesian coordiante system to display different series and it is the most commonly used charting component. 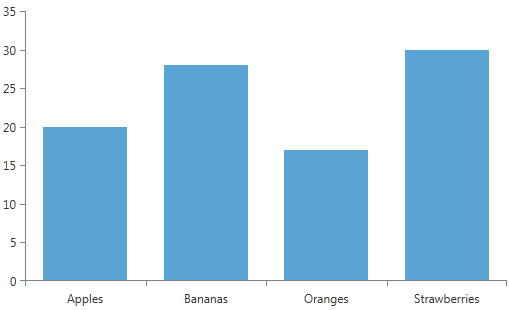 Example 1 demonstrates how to define the RadCartesianChart in XAML. The telerik namespace points to the telerik schema. "xmlns:telerik=http://schemas.telerik.com/2008/xaml/presentation"
If you run the project at this stage, RadCartesianChart will inform you that there are no axes defined, as seen in Figure 1. The Cartesian coordinate system is constructed using horizontal and vertical axes. 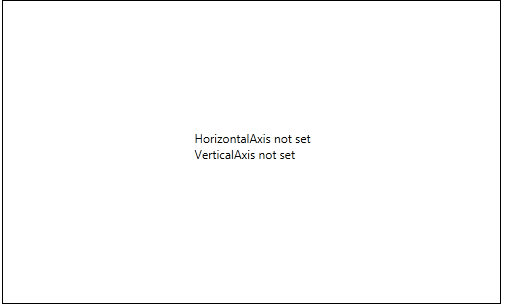 RadChartView exposes different types of axes that can be combined horizontally and vertically in different ways based on the scenario. You can find more information about them in our Axis article. This example will demonstrate a common scenario with a LinearAxis as the vertical axis of the chart and a CategoricalAxis as horizontal axis. Example 2 demonstrates how to define them in XAML. In the cases where no series are defined in the definition of the charting components, a message will be displayed to prompt you to enter a series. RadChartView exposes a large variety of series that can be used in different scenarios. Please take a look at the Series article to find out more about the available types. To complete the task of this tutorial, you need to define series with data points that will be rendered inside the charting component. You can do this by manually populating the Series collection of the RadCartesianChart control. This chart definition will be rendered on the screen as demonstrated in Figure 3. If you feel more confident working with code than with markup, you can achieve the same layout with the snippet from Example 4. In order to use the chartview components in code, you will need to add the required using directives that point to the Telerik namespaces. Although you can easily populate the RadCartesianChart Series directly with DataPoint objects, in most real-life applications, you will populate the series with business data. This is why all series types expose an ItemsSource property. You can bind that property to a collection of business items. And if you use a collection that implements the INotifyCollectionChanged interface, then any changes within the business data will be immediately reflected in the appropriate RadChartView components and vice versa. You can find more information in the Populating with Data section of our documentation.